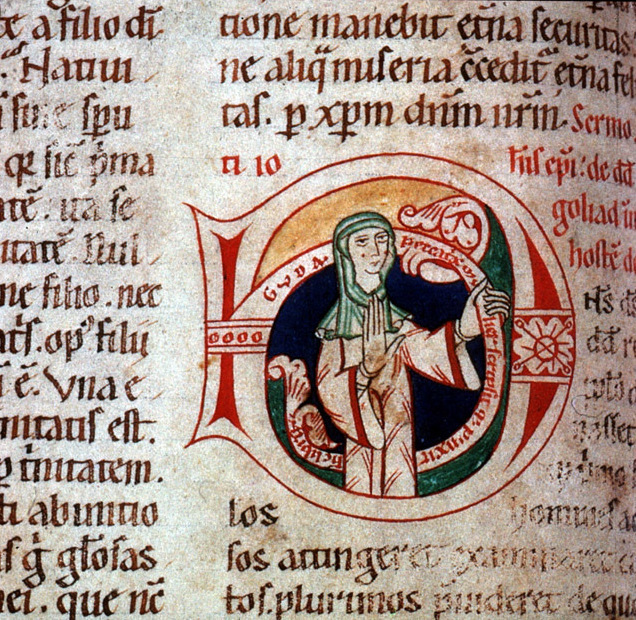 This image shows Guda, a 12th century nun, and the inscription reads, "Guda, a sinful woman, wrote and painted this book." It's a rare example of a manuscript signed by a female scribe. Centuries ago in the Middle Ages, religious scribes labored over lavishly illustrated books. Most of these illuminated manuscripts were made by anonymous artists. Now scientists say they have a new kind of evidence that could reveal who made these sacred texts. NPR's Nell Greenfieldboyce reports that the researchers found this evidence by accident in a medieval woman's teeth. NELL GREENFIELDBOYCE, BYLINE: There is some hard stuff that forms on teeth - maybe even your teeth - called tartar. CHRISTINA WARINNER: It's the thing you go to the dentist to have cleaned off of your teeth, but it's really an extraordinary material. GREENFIELDBOYCE: Christina Warinner is a researcher at the Max Planck Institute for the Science of Human History in Germany. She says sticky plaque traps microscopic bits of food, bacteria, even pollen. All of that is preserved as the plaque mineralizes and hardens into tartar. WARINNER: It's actually the only part of your body that fossilizes while you're still alive. GREENFIELDBOYCE: Recently, she was studying teeth from a medieval cemetery in Germany. The cemetery was pretty much all that remained of a small religious community of women. WARINNER: There's no books that survived. There is no art that survives. It's known only from a handful of scraps of text that mention it in passing. GREENFIELDBOYCE: The research she was doing had nothing to do with art or books. She was interested in oral health during this historical period. Her colleague, Anita Radini, was analyzing dental samples under the microscope and spotted something blue. She showed Warinner, who was floored. WARINNER: It was absolutely unbelievable. It almost looked like there were robins' eggs in the (laughter) - on the microscope slide. They were such vibrant, blue particles. GREENFIELDBOYCE: Warinner joked that maybe they'd found an artist who painted with lapis lazuli, a stone that was ground up in the Middle Ages to produce a vivid, blue pigment. WARINNER: And I just sort of threw that out there because I knew it was an absurd supposition. GREENFIELDBOYCE: After all, lapis lazuli was rare. Back then, it came from only one place in Afghanistan and was as precious as gold. To solve the mystery, the researchers looked at the particles' composition and mineral structure. WARINNER: And ultimately, we did find that it was indeed lapis lazuli, which was really, really surprising. GREENFIELDBOYCE: In the journal Science Advances, the researchers say this woman was likely a scribe and an artist. Alison Beach is a professor of medieval history at Ohio State University. She hopes this find will make historians think twice about old assumptions. ALISON BEACH: There's quite a bit of evidence of female contributions to book production, and it's gotten more attention in the past 20 years. But I still think that image of the monk as the producer of books is very central and very resilient. GREENFIELDBOYCE: Only a tiny fraction of the scribes who put their name on a book were female, but most scribes did not sign their name. BEACH: Was anonymous a man or a woman? And we really just don't know for most of them. GREENFIELDBOYCE: The new find has impressed Cynthia Cyrus of Vanderbilt University. She's studied medieval scribes associated with women's convents. She notes that the lapis lazuli residue seemed to be concentrated in this woman's front teeth, suggesting that the artist put her brush into her mouth. CYNTHIA CYRUS: As you put the tip of the brush into your mouth to bring it to a point, a little bit of the pigment residue then makes its way into the dental structure. And that would explain the differential between back of mouth and front of mouth. GREENFIELDBOYCE: She says this looks like a new way of telling who was a scribe and who was not. And historians will now be on the lookout. Nell Greenfieldboyce, NPR News. Transcript provided by NPR, Copyright NPR.